The neural retina is comprised of six major types of neurons and one type of glial cell, the Muller glia. These cells are organized in three layers. The apical, outer nuclear layer (ONL) contains both rod and cone photoreceptors. The inner nuclear layer contains bipolar, amacrine, horizontal and Muller glia cells, while the ganglion cell layer (GCL), on the basal side of the retina, contains ganglion and displaced amacrine cells. The nuclear layers are separated by two synaptic layers, the inner and the outer plexiform layers (IPL, OPL), where synaptic contacts are made. Vision begins with the absorption of light by the photoreceptors, a specialized type of sensory neuron which transduces light into an electric signal. This electric signal is then integrated and processed by the interneurons (bipolar, horizontal and amacrine cells) and transmitted to the brain by the ganglion cells, via the optic nerve. The neural retina is derived from the distal/ventral part of the optic vesicle, a protrusion of the neuroectoderm of the neural tube at the diencephalon level. The optic vesicle invaginates to form a double-layered optic cup, whose inner layer give rise to the retina. All of the cell types of the mature retina are derived from a pool of dividing multipotent retinal progenitor cells (RPCs) located in the inner optic cup. Cell differentiation is initiated in the inner layer of the central optic cup and progresses in a central-to-peripheral direction. 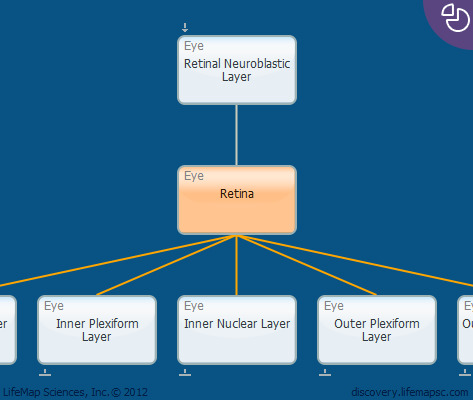 In addition, the different retinal cell types are generated in a fixed chronological sequence. Retinal ganglion and horizontal cells are generated first, followed, in overlapping phases, by cone photoreceptors, amacrine interneurons, rod photoreceptors, bipolar interneurons and finally, Muller glia cells.